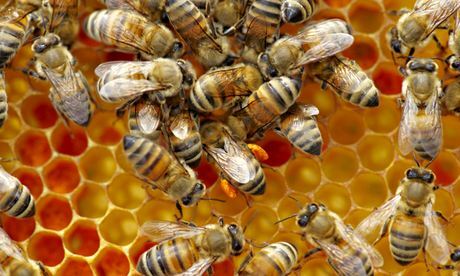 Harvard study shows neonicotionoids are devastating colonies by triggerring colony collapse disorder. Scientists found bees from six of the 12 neonicotinoid-treated colonies had left their hives and died. The mysterious vanishing of honeybees from hives can be directly linked to insectcide use, according to new research from Harvard University. The scientists showed that exposure to two neonicotinoids, the world’s most widely used class of insecticide, lead to half the colonies studied dying, while none of the untreated colonies saw their bees disappear. “We demonstrated that neonicotinoids are highly likely to be responsible for triggering ‘colony collapse disorder’ in honeybee hives that were healthy prior to the arrival of winter,” said Chensheng Lu, an expert on environmental exposure biology at Harvard School of Public Health and who led the work. The loss of honeybees in many countries in the last decade has caused widespread concern because about three-quarters of the world’s food crops require pollination. The decline has been linked to loss of habitat, disease and pesticide use. In December 2013, the European Union banned the use of three neonicotinoids for two years. In the new Harvard study, published in the Bulletin of Insectology, the scientists studied the health of 18 bee colonies in three locations in central Massachusetts from October 2012 till April 2013. At each location, two colonies were treated with realistic doses of imidacloprid, two with clothianidin, and two were untreated control hives. “Bees from six of the 12 neonicotinoid-treated colonies had abandoned their hives and were eventually dead with symptoms resembling CCD,” the team wrote. “However, we observed a complete opposite phenomenon in the control colonies.” Only one control colony was lost, the result of infection by the parasitic fungus Nosema and in this case the dead bees remained in the hive. Previously, scientists had suggested that neonicotinoids can lead to CCD by damaging the immune systems of bees, making them more vulnerable to parasites and disease. However, the new research undermines this theory by finding that all the colonies had near-identical levels of pathogen infestation. “It is striking and perplexing to observe the empty neonicotinoid-treated colonies because honey bees normally do not abandon their hives during the winter,” the scientists wrote. “This observation may suggest the impairment of honey bee neurological functions, specifically memory, cognition, or behaviour, as the results from the chronic sub-lethal neonicotinoid exposure.” Earlier research showed neonicotinoid exposure can damage the renowned ability of bees to navigate home. The new research follows similar previous work by the same group and comparison of the two studies shows that cold winters appear to exacerbate the effects of neonicotinoids on the bees. In the cold winter of 2010-11, 94% of the insecticide-exposed colonies suffered CCD compared to 50% in the new study.